Ben Tausig is a PhD student in ethnomusicology at NYU. 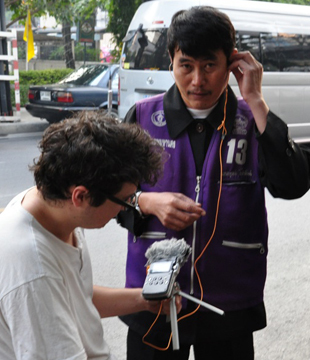 He is currently in Bangkok, Thailand, doing fieldwork on sound and noise in urban settings. His blog is Weird Vibrations. A series exploring the politics of urban sound in Bangkok and beyond, through first-person reporting, field recordings, and analysis. This episode describes twelve hours in the auditory lives of a unique class of laborers, Bangkok's motosai, the motorcycle taxi drivers known as the ears of the street. They absorb the city's noise and rumor, from the roar of traffic to the gossip of street vendors, long workday after long workday.